I love Christmas. One of my most popular Christmas blog posts is my advent calendar of family activities, which features 24 things to do in December with the kids. I think Christmas is a fabulous time to spend time with the people we love and to get out and about as much as we can with our kids. After all, time is the greatest gift you can give someone. One thing I have noticed recently though, is that much of Christmas nowadays, seems to have become about products, spending power, wishlists and telling our children that Santa only comes to well behaved children. This used to be known as the “season of goodwill”, but you don’t hear that phrase so much anymore. I want to teach my children about goodwill. About random acts of kindness, helping your local community and helping people less fortunate than yourselves. Because we might not feel like we have much to give right now, but that doesn’t mean we can’t give. We can give cheer, hope, smiles and goodwill. We can make gestures, some which cost a small amount and some which cost nothing. So here we are, creating a family goodwill advent calendar. 24 random acts of kindness. 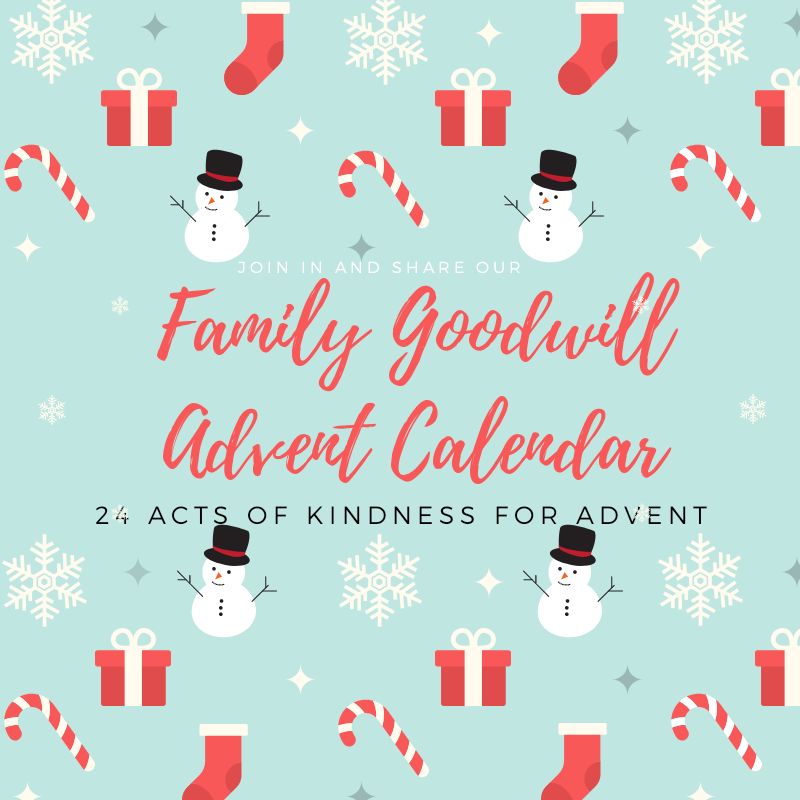 The idea of the goodwill advent calendar, is that you and your family, together, perform one act of goodwill, every day of advent. We are going to do this goodwill advent calendar ourselves and hope to either blog or video all of these. Most likely just a short clip each day, a minute or less, uploaded to our YouTube channel. I will come back to this post and add links to any posts or videos we do. We would hugely appreciate any likes or shares on social media, so we can share the Christmas cheer and encourage more people to offer kindness to others this Christmas. If anyone wants to join in with our goodwill advent calendar, please let us know what you get up to in the comments of this post. Give somebody a secret gift. Buy them something and find a way to give it to them, without them knowing who it was! Buy your Christmas cards from a charity shop, preferably a charity close to your heart. Send a Christmas card to someone who is lonely. We recently had a campaign envelope come through the post. It said, “If you only send one card this Christmas…” and encourages you to write in the card and send it back. The charity then send the card on to someone who is lonely, vulnerable or homeless. Take magazines which you have already read, to your local doctors surgery or hospital waiting room. Rather than just putting them straight in the recycling bin, someone who has a long wait will have the opportunity to read something current, rather than from three years ago. Donate to your local PTA. Most schools have Christmas fairs and whether you donate a really nice raffle prize or a cheap bottle of lemonade for the tombola, they’ll surely appreciate it. Find a local book swap. Some banks, coffee shops and librarys have them. Often you can buy a book for a small donation or swap a book. Instead of taking one home, leave one there. Realistically, how many times are you likely to read the same book over and over anyway? Donate the things you no longer want, use or need, to a charity shop. Good quality items though, so that other people will want to buy them and raise money for the charity. Leave a Christmas card for the postman, bin man and milk man. If you can afford it, include a tip or small gift. If you can’t afford to, perhaps make the card yourself, to show some thought has gone into it? Send a friend or loved one a random message, out of the blue, complimenting them or telling them why you admire them or what you love about them. Buy a suspended coffee. There are many coffee shops (usually independents) which allow you to buy a coffee for someone in need. Get your children to write short notes for the teachers at their school. Something along the lines of, “I think you are a great teacher because…” and ask the receptionist to put them in the teachers pigeonholes. If your children are in secondary school and don’t want people to know, they could write them anonymously and post them. Contact your nearest animal shelter and ask what they need. They always welcome donations of pet food, but many also ask for donations of old blankets or towels. That old tatty towel or blanket in the back of your airing cupboard might make a deserted old dog warm on a cold Christmas night. Visit a nursing home. Call ahead first. Nursing homes often love visits from people. You could be dropping off a plant to brighten the lounge or some cookies for the staff, or giving up half an hour of your time to chat to an elderly lonely person. Give somebody something homemade. Perhaps a Christmas tree decoration? Take a Christmas card (and gift if you can afford it) in to the teachers and reception staff at your children’s school. Leave a few coins and a note in the coin slots of a washing machine at your nearest launderette. Add a nice note if you like. Give somebody something they really need. Whether that is a hug, a chat or something practical. Sign up for a charity event to do in the new year. Keep the goodwill going. Tape a coin to a vending machine, with a post it note, for the next person who comes along. Whether it’s 10 pence or a pound, it’ll put a smile on someone’s face. Bake some cakes or cookies and take them round to one of your neighbours. Leave an anonymous gift on the doorstep of someone you think will really appreciate it. Perhaps a box of chocolates for a single parent family who are living on a very low income. Perhaps someone who is working very hard lately or even someone who you’ve just not seen a smile from in a while. Donate to a food bank. Food banks are hugely in demand at Christmas. Nobody chooses to use a foodbank, but it’s a lifeline for people in need. Food banks have lists of their most needed items and whether you buy the value brand or the luxury brand, these items will be hugely appreciated! Get your children to record short video clips, for a family member that you wont see on Christmas day, and send it to them. Take food, hot drinks and a Christmas card to the homeless, in the evening, after all the shops have shut. It’s a cold and miserable time to be sleeping on the streets. 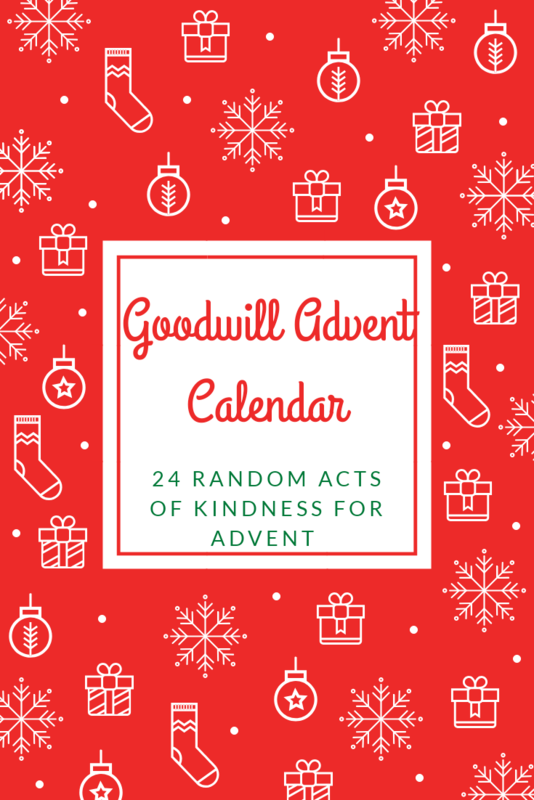 I hope you’ve taken some inspiration from our goodwill advent calendar and I would love for as many people as possible to join in with these gestures. Please also share this post on social media, so we can spread the goodwill as far as possible. Let’s put the goodwill back into the season of goodwill! This entry was posted in Christmas and tagged Goodwill advent calendar. Bookmark the permalink. ← Changes. Doctors. Tests. The Fear of cancer returning. Aww! How lovely! What a fantastic idea!